The BIG Family History Fair returned to St Ives, Cambridgeshire, this weekend, and I learnt a load about the significance of manorial records in genealogy, and let the moths out of my wallet at the Bedfordshire Family History stand. 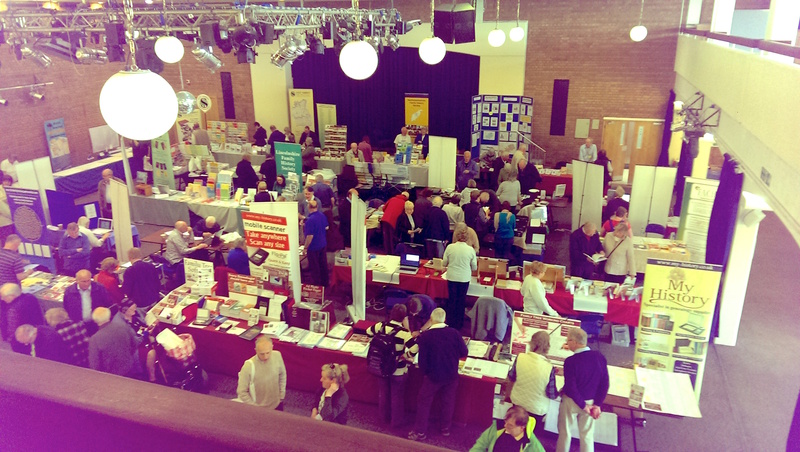 This weekend I have been at The BIG Family History Fair 2015, at The Burgess Hall in St. Ives, Cambridgeshire. 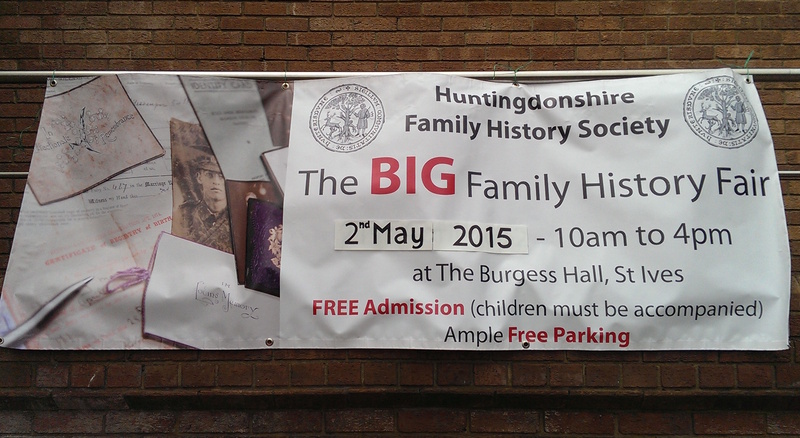 The Big Family History Fair 2015 banner flapped in the breeze to usher you in. It a one day (on Saturday) with free admission, that attracts family history fans from the area. There’s a series of talks and a wide range of trade stands from the likes of local history societies, the Guild of One-Name Studies, historic postcard companies, and some familiar faces in the genealogy supplies market like Maxbal Genealogy and My History. This is my second visit here, and the first show here since 2012’s. After enjoying a cuppa in the gym café next door, I arrived about 20mins in, and paid the £2 for my first lecture ticket. After a quick initial wander around, and the pleasure of bumping into blogging and twitter comrade Jane Freeman, I made my way upstairs for my first lecture at 10:30am. Philip Saunders, project officer of the Manorial Documents Register at the National Archives, began his talk ‘To The Manor Born: What Manorial Records Can Tell You About Your Ancestors‘. Manorial records are, as yet, an un-tapped source for me. I know they’re out there for a wide number of Cambridgeshire and Huntingdonshire manors, but I’ve been busy contending with the swathes of other records available to me. I’ll get to them eventually. 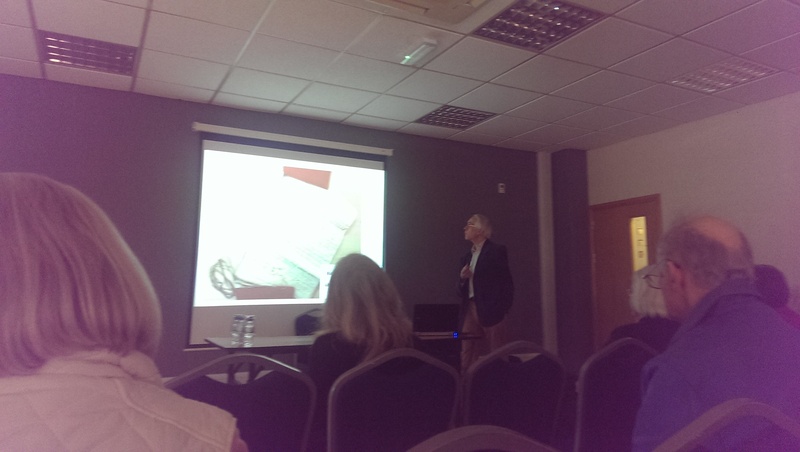 However, Philip’s talk was expertly delivered for a complete novice like me – he took time to explain how and why documents existed, and illustrated his talk throughout with examples – most of which were contextually relevant and being from Cambridgeshire or Huntingdonshire. Philip Saunders showing us how a folded little file from the Manorial Records actually contains a LOT of information when you open it out. He showed us how what looks like a small folded piece of paper, can actually open out to give you dozens of names, dates, and other bits of information that is otherwise going un-detected in genealogy research. His work has been to bring a register of the manorial records for Cambridgeshire and Huntingdonshire to The National Archive website, and he showed us how to find some of these already for neighbouring counties. Apparently Cambridgeshire and Huntingdonshire data will start to appear on the site soon via the ‘Record Creators’ tab of advanced search. I was amused to see that one document even carried what was a 16th century drawing of a Huntingdonshire labourer struggling with his crutches! Having finished his talk, I returned downstairs, this time for a proper browse of the stands. Hall one of two, was home to some familiar genealogy brands and societies. It was hard to get anywhere near the postcard stands (I like finding advertorial postcards of one of my Ely relative’s bakery, and I’m looking out for some of the now defunct village pubs that my family have run over the generations). The one stall that was definitely on my list was the Bedfordshire Family History Society stand, and I was pleased to find their team very helpful. Having checked my now quite large pile of Parish Register CD-roms the night before, I had two parishes on my list: Leighton Buzzard, and Wrestlingworth. Of course, as soon as I’d got home, I started to explore, and so began my journey back into the 17th century to find my Truelove, Goodsole and Miller ancestors. If you haven’t heard from me by Tuesday morning, give me a nudge! This week’s Surname Saturday themed posting looks at my family name of GILLIONS from Bedfordshire, England. This week’s Surname Saturday post takes a look at my Gillions family living in 18th Century rural Bedfordshire, England. 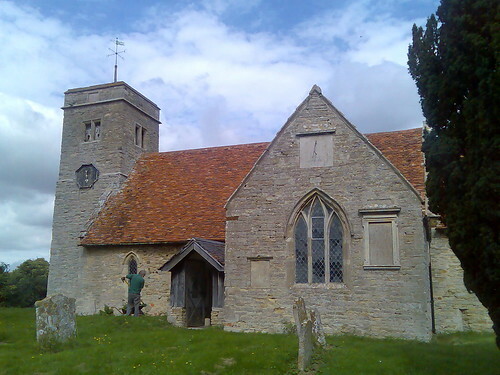 The earliest ancestor that I’ve located was my Great Great Great Great Great Paternal Grandfather, William Gillings, born in about 1730 at Dunton, Bedfordshire. He appears to have been the son of John and Mary Gillings, and the oldest child of three – although his two younger siblings (Sarah – 1732, and John – 1734) were baptised in nearby Wrestlingworth. 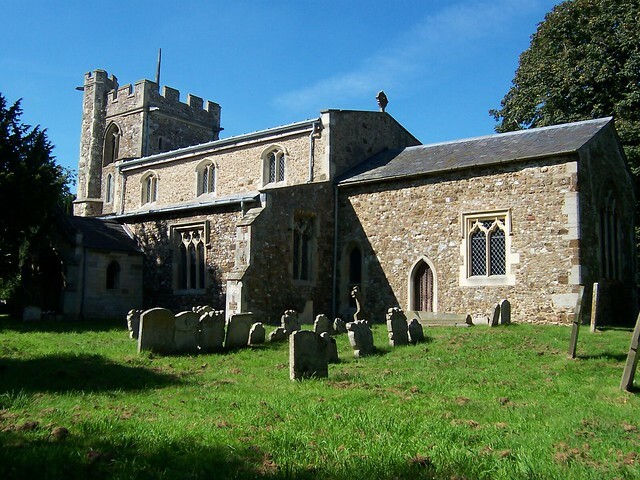 Wrestlingworth parish church in Bedfordshire, was no stranger to my Gillions family. William appears to marry Elizabeth Miller on 25th January 1763 at Wrestlingworth, when he was about 33 years old, and she was 32. The couple had at least 4 children – my Great x4 Grandmother Susan (often ‘Susannah’) in 1771, Elizabeth in 1771, Mary in 1774, and William in 1777. Sadly, Elizabeth died in 1780 at the age of about 49. Three years later William walked the aisle again at Wrestlingworth to marry Sara Fielding on 16th September 1783. William was again widowed in 1807, and he followed Sara to the grave in 1810 at the age of 80. My most recent ancestor being my Great x 4 Grandmother Susan Gillons, was baptised on 24th November 1771. 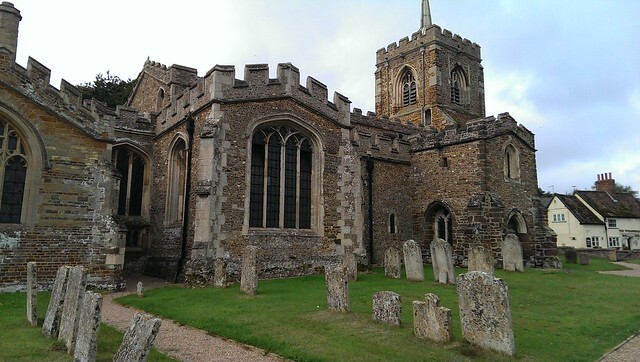 Gamlingay parish church – what led Edward and Susan to marry here in 1795? She married Edward Gilbert on 2nd March 1795 at Gamlingay, Cambridgeshire – a village on the border of Bedfordshire and Cambridgeshire. There’s no indication as to why they married here, as I can’t see any other church records relating to this village. Neither were from this village (he was from Abbotsley, she being from Wrestlingworth), so perhaps they met here? Maybe their local church was undergoing repairs? Perhaps they didn’t get on with their local vicar? Perhaps they married here in secret and against their parents’ wishes? Further examination of the Gamlingay records will probably reveal more, or nothing else, leaving it purely to speculation of a BAFTA kind. With nine children, and Edward on a meagre labourer’s wage, the family fell on hard times. By 1851, and with their children grown up, Edward and Susan turn up with their second eldest married daughter Mary Cade in Abbotsley. Susan is noted as ‘blind’, as is her son-in-law Thomas Cade, whist Mary is noted as deaf.. leaving Edward aged about 77 and the only member of the household with his sight and hearing. Both he and Susan are unsurprisingly noted as ‘paupers’. Times must have been so hard for them. Susan died in 1859, aged about 88. She’d outlived Edward, who had died in 1852. Surname Saturday theme : Truelove of Leighton Buzzard, Bedfordshire. The Truelove surname is one of my favourites. More so when I discovered that my Truelove ancestor married someone with the surname of Goodsole. You can only imagine that they were therefore the ideal couple. The earliest record of my Truelove ancestry is John Truelove and his marriage in 1671 to Eleanor Goodsole in Leighton Buzzard, Bedfordshire. John is noted as a tailor and other than this scrap of information, I’ve yet to find anything else for certain about him. I’ve received a copy of a handwritten tree but this gives his death in October 1751 in Potton, Bedfordshire. I find this difficult to believe as in 1671 he would have been in his late teens or early 20s (an average guess there), which means that by 1751 he would have been around 100 years old. I’m guessing that the 1751 death may have been a son or nephew, rather than he himself. His birth is currently elusive although I admit that I have yet to check the Leighton Buzzard records in person. However, those who I believe are his parents – Edward Truelove and Joan Pratt were married in the parish in 1654. There is one John Truelove born in 1649 to an Edward Truelove, but this is in Bishopsgate, London. If this was him, then it would appear that Edward (at the age of just 17) fathered him with a woman named Elizabeth. If this idea is correct, then Joan Pratt would be John’s step-mother. John and Eleanor had six known child – including Elizabeth (my ancestor) who went on to marry William Hale of Knotting, Bedfordshire, and my brief coverage of my Truelove ancestry passes on.